Everyone needs to know how to make a Soup Broth – Beef, Chicken, or Ham bones are a necessity for great flavor. A great stock is the base for a great soup. Buying store-bought stock/broth or using stock cubes is ok when you’re in a hurry, and certainly more convenient. Well maybe its never ok to use stock cubes or store-bought stock for soup, that’s just clever marketing. So is store-bought stock tastier and healthier? I hope everyone knows that it’s not. Have you read the ingredients on the back of some of these stocks? Mostly unpronounceable words and additives, preservatives, lots of flavoring, not to mention the sodium content. It doesn’t take long to make a good tasting stock. Roughly chop the vegetables and throw into a large stock pot with the soup bones. You don’t have to watch it simmer for 4 hours, the hard parts done! Don’t even peel the carrots, the vitamins from the peels just add to the nutrients in your stock. Some people roast their soup bones before they go into the pot, I think it just adds extra work. Quickly frying the vegetables brings out a deeper flavor in the stock, and doesn’t add extra dishes if you use the same stock pot. Plus the aroma released from frying onions with celery take me back to my childhood. This Broth recipe will make Beef Stock, Chicken Stock, or Ham Stock. Just choose your meat of choice. You could also make a tasty vegetarian Vegetable Stock recipe if you prefer. For the recipe I photographed, I used some left over bone-in leg ham that I had in the freezer. Not only did I have a great bone broth or stock, but some lovely ham pieces to add into my soup. Homemade Soup Broth recipe made from bones. Healthy and nutritious, make Beef Broth, Chicken Broth or Ham Broth with this easy recipe. 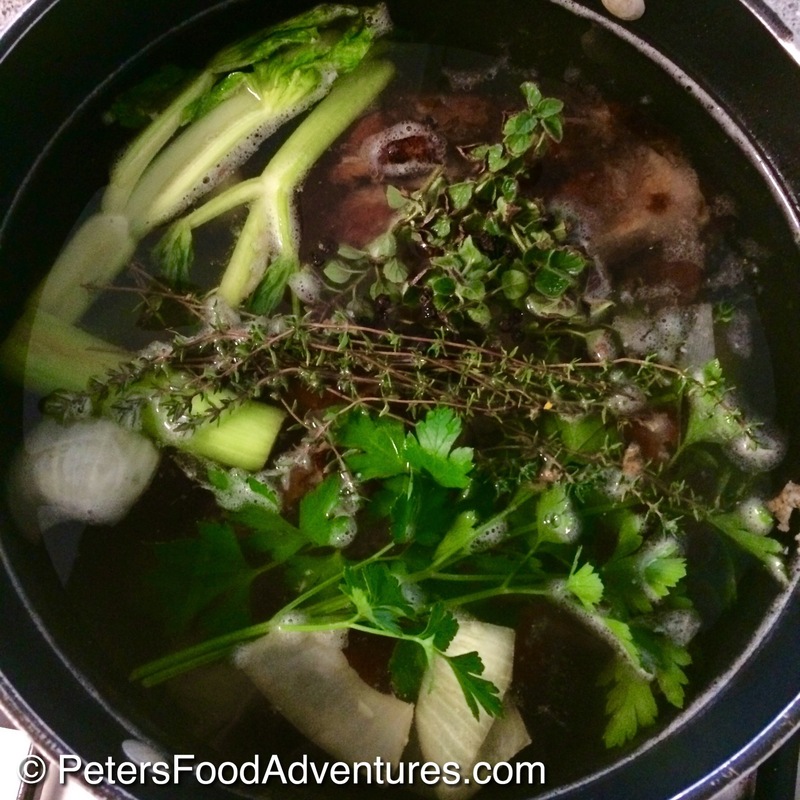 A delicious bone broth, freeze it for later or use right away in your favorite soup! Bon Appetit! Приятного аппетита! Place soup pot on the stove. Heat the oil on high and when its hot, add the onions and carrots and stir for about 10 minutes until caramelizes. Add the celery and garlic and continue to caramelize the vegetables for another 5 minutes on medium heat. Add your bones into the pot and fill the pot with water. Add peppercorns, and the herb sprigs to the pot and bring to a boil. During the cooking process, skim off any impurities off the top while simmering. Strain the soup into a colander over a large bowl to remove the big bones and vegetables. Using a cheesecloth (muslin), strain the soup again to remove the small impurities to make a clear broth. Your stock is now ready to use for your soup. Any excess stock, easily freezes for another meal. Note: This stock isn't seasoned. Season with salt and pepper during the soup making process. I use 2-3 pounds of beef bones, or 2 chicken carcasses, or 2 pounds of ham hocks.